Even after reports surfaced of forced labor in the Southeast Asian fishing industry, ships crewed by enslaved migrants persist. Can satellite surveillance smoke them out? On January 13, 2016, three days before this photo was taken, enslaved Cambodian migrants were found aboard the Sor Somboon 19 and other Thai fishing boats while the vessels docked at the port of Ranong, Thailand. 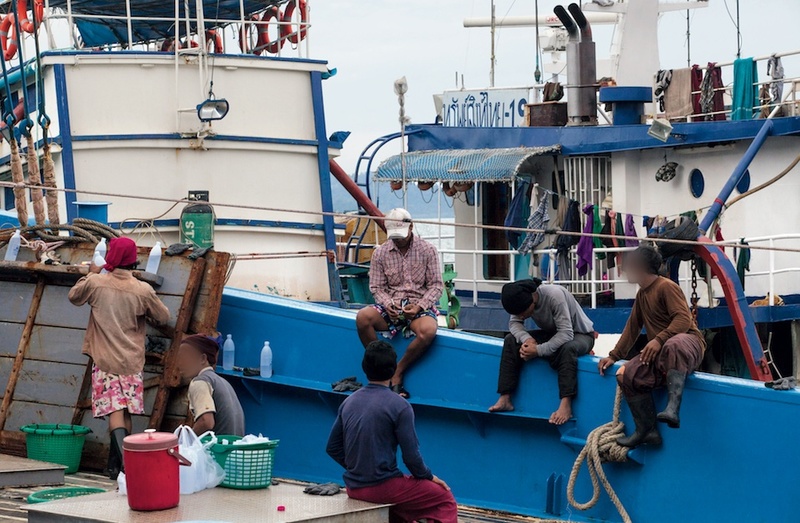 In December 2016, the environmental organization published an investigative summary revealing, among other crimes, further incidences of forced labor involving Thai ships. Five of the 30 Cambodian migrants on the Sor Somboon 19 died at sea; the 25 survivors suffered severe malnutrition. Together, the Kor Navamongkolchai 1 and Kor Navamongkolchai 8 held 15 additional Cambodians captive for over a year. “We were kicked, punched, and beaten with sticks,” one told a Greenpeace investigator. 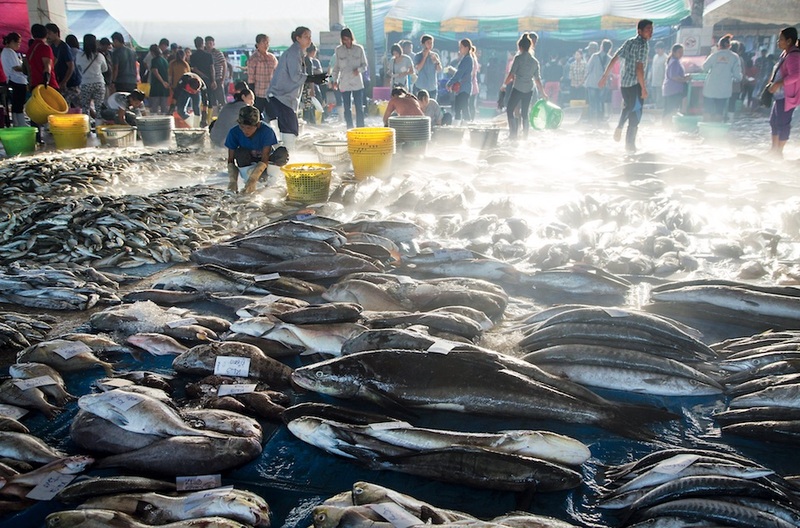 By March 2017, the Thai government had issued mandatory recalls of its overseas fishing vessels, prosecuting and impounding 61 boats and insisting that the others employ satellite monitoring systems. KEEP YOUR EYE ON THE WATER. When Greenpeace tracked the Blissful Reefer’s AIS signals, the satellite system remained largely the purview of ship captains. Today, however, anyone with internet access can monitor commercial fishing boats worldwide, in near-real time, thanks to the user-friendly Global Fishing Watch (GFW) map, launched in September 2016. Above, we overlaid Greenpeace’s abbreviated version of the Blissful Reefer’s route atop a screenshot of the GFW map. If you go to globalfishingwatch.org and click on the map’s light-blue dots, which denote fishing activity, you’ll find information about those boats and their routes. By mid-January 2018, the GFW hopes to have integrated AIS data from refrigerated cargo tankers, or reefers, into the publicly accessible map as well. Satellite map courtesy of Global Fishing Watch. Ship route courtesy of Greenpeace; iIllustration by Susan Huyser. A refrigerated cargo tanker named the Blissful Reefer collected the catch and delivered supplies to Thai fishing boats at sea, allowing them to avoid ports where nefarious activity might be detected. 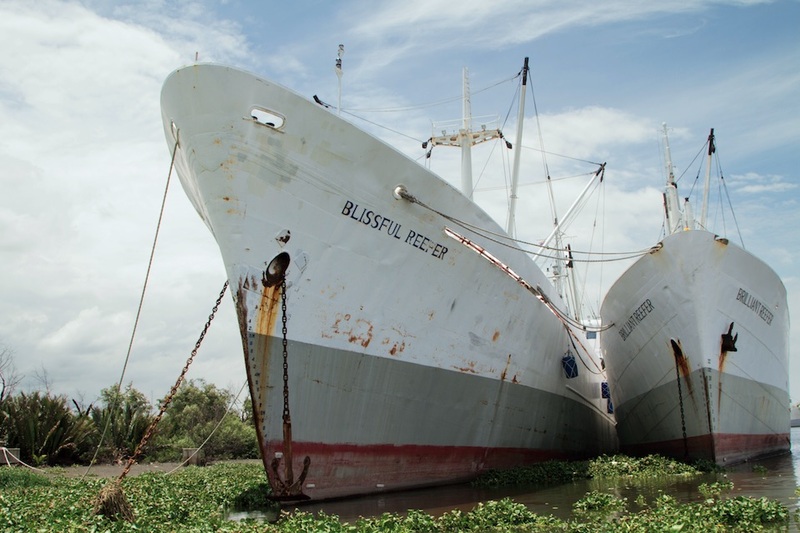 The Blissful Reefer itself was once found to be trafficking eight slaves. The tanker returned to the port at Samut Sakhon, Thailand, in January 2016, where it has been docked ever since.